John David Podesta Jr. (born January 8, 1949) is an American political consultant who served as White House Chief of Staff to President Bill Clinton from October 20, 1998 until January 20, 2001 and as Counselor to President Barack Obama from January 1, 2014 until February 13, 2015. Before that he served as the White House Staff Secretary and White House Deputy Chief of Staff for Operations for the Clinton Administration between January 20, 1993 until October 20, 1998. He is the former president, and now Chair and Counselor, of the Center for American Progress (CAP), a think tank in Washington, D.C., as well as a Visiting Professor of Law at the Georgetown University Law Center and was chairman of the 2016 Hillary Clinton presidential campaign. Additionally, he was a co-chairman of the Obama-Biden Transition Project. Podesta spent most of his early years in Chicago, where he was born, growing up in the neighborhood of Jefferson Park on the city's Northwest Side. His mother, Mary (née Kokoris), was Greek-American, and his father, John David Podesta, Sr., was Italian-American. Tony Podesta, a lobbyist, is his brother. Podesta's father did not graduate from high school, but encouraged his children to attend college. In 1967, Podesta graduated from Lane Tech High School in Chicago. Podesta met Bill Clinton in 1970 when they worked in Connecticut for Joseph Duffey, a candidate for the United States Senate. In 1971, he graduated from Knox College, Galesburg, Illinois, where he had served as a volunteer for the presidential candidacy of Eugene McCarthy. He received his J.D. from Georgetown University Law Center in 1976. 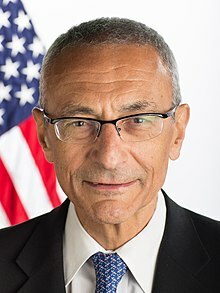 Podesta worked as a trial attorney for the Department of Justice's Honors Program in the Land and Natural Resources Division (1976–77), and as a Special Assistant to the Director of ACTION, the Federal volunteer agency (1978–79). His political career began in 1972, when he worked for George McGovern's unsuccessful presidential campaign. Podesta held positions on Capitol Hill, including Counselor to Democratic Leader Senator Thomas Daschle (1995–96); Chief Counsel for the Senate Agriculture Committee (1987–88); Chief Minority Counsel for the United States Senate Judiciary Subcommittee on Patents, Copyrights, and Trademarks; Security and Terrorism; and Regulatory Reform; and Counsel on the Majority Staff of the Senate Judiciary Committee (1979–81). In 1988, he and his brother Tony co-founded Podesta Associates, Inc., a Washington, D.C., "government relations and public affairs" lobbying firm. Now known as the Podesta Group, the firm "has close ties to the Democratic Party and the Obama administration [and] has been retained by some of the biggest corporations in the country, including Wal-Mart, BP and Lockheed Martin." Podesta served as both an Assistant to the President and as Deputy Chief of Staff. Earlier, from January 1993 to 1995, he was Assistant to the President, Staff Secretary and a senior policy adviser on government information, privacy, telecommunications security and regulatory policy. Podesta was the first White House staffer to get the news of the Lewinsky scandal and was put in charge of managing the crisis. In 1998 he became President Clinton's Chief of Staff in the second Clinton Administration and executed the position until the end of Clinton's time in office in January 2001. Podesta encouraged Executive Order 12958 which led to efforts to declassify millions of pages from the U.S. diplomatic and national security history. Podesta meeting with Bill Clinton and Georgetown University president John J. DeGioia in 2006. In 2003, Podesta founded the Center for American Progress, a liberal think tank in Washington, D.C., and served as its president and CEO until he stepped down in 2011. (CAP chief operating officer Neera Tanden succeeded Podesta as president and CEO, taking over day-to-day operations.) Podesta remained chairman of the nonexecutive board of directors for a time, and remains on the board today, although not as chairman. Podesta has taught at his alma mater, Georgetown University Law Center, many times over the years, teaching classes on congressional investigations, law and technology, legislation, copyright and public-interest law. On the Georgetown faculty, Podesta's title is Distinguished Visitor from Practice. From 2002–14, Podesta served as a member of the Constitution Project's bipartisan Liberty and Security Committee. In 2008, he authored The Power of Progress: How America's Progressives Can (Once Again) Save Our Economy, Our Climate, and Our Country. In 2009, he accompanied former President Bill Clinton to North Korea for negotiations securing the release of two American journalists imprisoned on espionage charges. He can be seen in numerous widely circulated photographs of Clinton meeting with Kim Jong-il. Podesta opposes the excessive use of classification, and in a 2004 speech at Princeton University condemned what he called the U.S.'s "excessive government secrecy" and "bloated secrecy bureaucracy". Podesta has called Executive Order 12958, "which set tough standards for classifying documents and led to the unprecedented effort to declassify millions of pages from our nation's diplomatic and national security history," as "perhaps the biggest accomplishment of the Clinton administration." More than 800 million pages of intelligence documents were declassified as part of the program. Podesta is described as "a longtime advocate for government disclosure of UFO files." Podesta has supported petitions by some who believe UFOs are alien spacecraft to the government to release files related to the subject. At a 2002 news conference organized by Coalition for Freedom of Information Podesta stated that, "It is time for the government to declassify records that are more than 25 years old and to provide scientists with data that will assist in determining the real nature of this phenomenon." Podesta wrote the forward for a book by Leslie Kean titled "UFOs- Generals, Pilots, and Government Officials Go On The Record". The book details numerous contact events by these trained personnel. John Podesta testifies before the Senate Budget Committee Task Force on Government Performance. Podesta became an honorary patron of the University Philosophical Society in March 2006. Podesta is an emeritus member of the Knox College Board of Trustees. Podesta has served on the board of directors of Bedford, Massachusetts-based energy company Joule Unlimited since January 2011. He has also served on the board of the Portland, Oregon-based Equilibrium Capital. In 2013, Podesta earned $90,000 as a consultant to the West Chester, Pennsylvania-based HJW Foundation, a nonprofit group led by Swiss billionaire Hansjörg Wyss. He was the U.S. representative to the UN High-Level Panel on the Post-2015 Development Agenda. After the 2016 election, Podesta joined The Washington Post as a columnist. On October 7, 2016, WikiLeaks started to publish thousands of emails reportedly retrieved from Podesta's private Gmail account, some of which contained controversial material regarding Clinton's positions or campaign strategy. Podesta and the Clinton campaign did not confirm or deny the authenticity of the emails. Experts investigating the leak, including a private security firm called CrowdStrike, claimed to have tracked the hacking tools used, and claimed that a Russian hacking group had accessed Podesta's account. Podesta said that Russian intelligence officials attempting to influence the presidential election in favor of Donald Trump were behind the leak. The United States Intelligence Community released a statement directly accusing Russian intelligence of involvement. Vice President Joe Biden told NBC News that the United States was "sending a message" to Russian President Vladimir Putin and that a wide-ranging "clandestine" cyber operation would take place in response to the Russians' activities. When asked about the leaks, Vladimir Putin replied that claims of Russian involvement were false. "The hysteria is merely caused by the fact that somebody needs to divert the attention of the American people from the essence of what was exposed by the hackers." John Podesta identifies himself as a Catholic and has worked closely with Catholics in Alliance for the Common Good and Catholics United. He and his wife Mary Podesta, a Washington, D.C. attorney, married in 1978 and have three children. His daughter, Megan Rouse, is the president of the Dublin Unified School District (CA) Board of Trustees. Podesta is an avid cook. ^ "John Podesta to leave White House post in February". Politico. January 13, 2015. Retrieved January 13, 2015. ^ Talev, Margaret (December 10, 2013). "Obama to Name Former Clinton Official Podesta as Special Adviser". BusinessWeek. Retrieved December 10, 2013. ^ "Obama, McCain Transition Efforts Are Worlds Apart". Huffington Post. October 8, 2008. Retrieved July 17, 2011. ^ "Washington Post". Who Runs Gov. Archived from the original on July 17, 2011. Retrieved July 17, 2011. ^ Sweet, Lynn (November 6, 2008). "All-business Obama begins transition to White House". Chicago Sun-Times. Archived from the original on December 10, 2008. ^ Fusco, Chris (March 12, 2007). "Cooking, wit nourished D.C. Dem elite: Younger son was chief of staff to Bill Clinton". Chicago Sun-Times. ^ Crispin, Jessa. "Podesta: Progressive Politics Will Cure U.S. Ills". NPR. Retrieved July 17, 2011. ^ Pear, Robert; Broder, John M. (September 5, 2000). "In a Lobby-Happy Washington, Politics Can Be Even Thicker Than Blood". The New York Times. ^ a b Baker, Peter (February 15, 2015). "For Hillary Clinton, John Podesta Is a Right Hand With a Punch". New York Times. Retrieved February 16, 2015. ^ Clinton, Bill. (2004). My life, New York: Alfred A. Knopf. pg. 176; ISBN 9780375414572. ^ "Alumni Honored with Paul Dean Award". Georgetown Law School. October 18, 2011. Retrieved July 4, 2017. ^ Podesta, John. "During a guest appearance on Wait Wait, Don't Tell Me, broadcast May 17, 2014". ^ Elliott, Justin (January 28, 2011) "Who's doing Mubarak's bidding in Washington?" Archived January 29, 2011, at the Wayback Machine, salon.com; accessed February 16, 2015. ^ Whipple, Chris. (2017). The gatekeepers : how the White House chiefs of staff define every presidency. New York : Crown p. 209. p. 211. ISBN 9780804138246. ^ Kean, Leslie (February 20, 2015). "John Podesta: Pulling Back the Curtain on UFOs". Huffington Post. Retrieved December 10, 2015. ^ Janie Lorber, CAP Faces Challenges as Podesta Steps Back, Roll Call, October 25, 2011. ^ a b c Josh Rogin, John Podesta stepping down as head of CAP, Foreign Policy, October 24, 2011. ^ Jonathan Allen, W.H., CAP to counter Podesta attacks, Politico.com, December 12, 2013. ^ CAP Board of Directors, Center for American Progress; accessed August 5, 2016. ^ a b John F. Harris, Podesta to Teach at Georgetown, Washington Post (February 5, 2001). ^ a b Our Faculty: John Podesta, Distinguished Visitor from Practice, Georgetown University Law Center, August 5, 2016. ^ "The Liberty and Security Committee". Constitution Project. Retrieved August 6, 2016. ^ "Clinton in North Korea". Los Angeles Times. Retrieved July 7, 2016. ^ a b John Podesta 2004 Remarks at Princeton University, Center for American Progress, March 10, 2004. ^ Shipman, Tim (November 30, 2008). "UFO enthusiasts call on Obama to release X-Files". The Daily Telegraph. London, UK. Retrieved December 23, 2008. ^ Lee Speigel, John Podesta: I've Convinced Hillary Clinton To Declassify UFO Files, Huffington Post (March 3, 2016). ^ Norman, Tony (December 2, 2008). "Change is coming (but not for space aliens)". Pittsburgh Post-Gazette. Retrieved December 23, 2008. ^ Kean, Leslie (2010) "UFOs- Generals, Pilots, and Government Officials Go On The Record" Harmony Books/Random House. ^ "Board of Trustees". Knox College. December 15, 1957. Retrieved July 27, 2016. ^ a b Eric Lipton, New Obama Adviser Brings Corporate Ties, New York Times (December 12, 2013). ^ Joule elects John Podesta to its Board of Directors Archived August 19, 2016, at the Wayback Machine, Joule Unlimited (accessed August 5, 2016). ^ "UN Secretary-General appoints high-level panel on post-2015 development agenda". United Nations Development Programme. July 31, 2012. Retrieved January 17, 2014. ^ Sterne, Peter. "John Podesta joins The Washington Post as contributing columnist". Politico. Retrieved February 24, 2017. ^ a b Chozick, Amy (October 11, 2016). "John Podesta Says Russian Spies Hacked His Emails to Sway Election". The New York Times. Retrieved October 13, 2016. ^ Franceschi-Bicchierai, Lorenzo (October 20, 2016). "How Hackers Broke Into John Podesta and Colin Powell's Gmail Accounts". Motherboard (Vice). Retrieved November 23, 2016. ^ Greenwald, Glenn (October 11, 2016). "In the Democratic Echo Chamber, Inconvenient Truths Are Recast as Putin Plots". The Intercept. Retrieved October 20, 2016. ^ Campanile, Carl (October 8, 2016). "Wikileaks releases excerpts of Hillary's paid speech transcripts". New York Post. Retrieved October 16, 2016. ^ Chozick, Amy; Confessore, Nicholas; Michael, Barbaro (October 7, 2016). "Leaked Speech Excerpts Show a Hillary Clinton at Ease With Wall Street". The New York Times. ISSN 0362-4331. Retrieved October 16, 2016. ^ Dowling, Brian (October 15, 2016). "Report: CIA has Kremlin in cyber sights". Boston Herald. Retrieved October 15, 2016. ^ Tacopino, Joe (October 14, 2016). "US prepped for massive cyber assault on Russia". New York Post. Retrieved October 15, 2016. ^ Healy, Patrick; David E., Sanger; Haberman, Maggie (October 12, 2016). "Donald Trump Finds Improbable Ally in WikiLeaks". The New York Times. ISSN 0362-4331. Retrieved October 19, 2016. ^ Staff (October 15, 2016). "CIA Reportedly Preparing Major Cyber Assault against Russia in Wake of Hack Attacks". Fox News. Retrieved October 19, 2016. ^ Pulliam Bailey, Sarah. "John Podesta, Son of the Church". First Things. Retrieved October 19, 2016. ^ Lawton, Kim (October 8, 2004). "Catholic Voters". Religion & Ethics Newsweekly. WNET. Retrieved April 3, 2011. ^ Endicott, William T. (2003). An Insider's Guide to Political Jobs in Washington. Hoboken, NJ: John Wiley & Sons. p. 238. ISBN 978-0-471-47362-6. ^ Elliott, Philip. "Democratic wise man splits loyalties between Obama, Clinton". Retrieved November 6, 2016. ^ "Board of Trustees / Board of Trustees". www.dublin.k12.ca.us. Retrieved November 5, 2017. ^ "Dublin School Board Trustee Megan Rouse Responds to WikiLeaks Allegations". OneDublin.org. October 26, 2016. Retrieved November 5, 2017. ^ Bennett, Kate. "The Podesta brothers are ready to cook for Hillary". Politico. Retrieved November 6, 2016. Wikimedia Commons has media related to John Podesta.